The Magical Christmas Wreath Company: Glam-O-Ween ! Whilst flicking back through my personal archives in search of inspiration for the finishing touches to tonight's party, I discovered quite a few glamorous and fun Halloweeny looks that I created whilst working here and there. They immediately got me in the Gothic party mood. 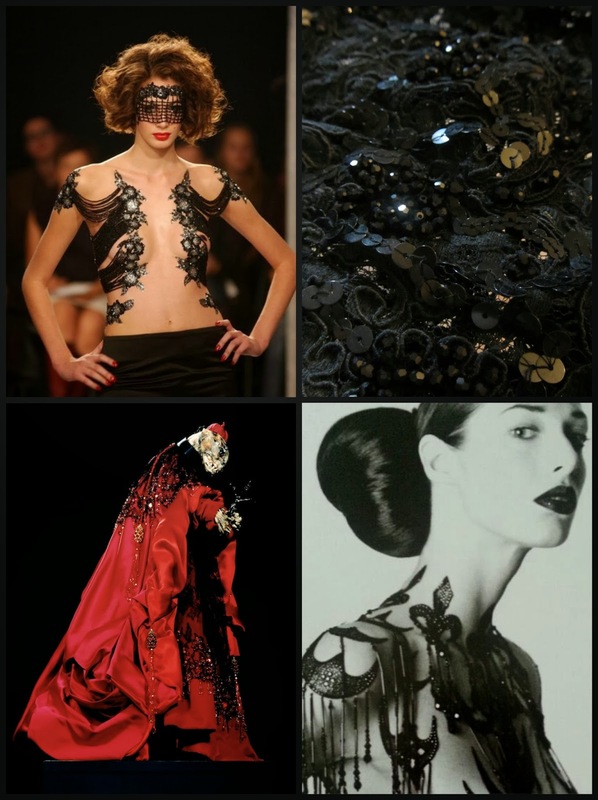 Whatever you get up to tonight, keep it Gothic, keep it Creepy but most of all, keep it Glam! Glam o Ween - party at yours next year? I love that red number...it looks like the pope on steroids!! I can only take credit for its beaded lace veil Cindy. I was invited to work on it and leapt at the chance to weave a little bead magic in amongst the genius design. You are so talented Mr P! Happy glamo-ween! Thank you lovely Pamela, Happy Glam O Ween! You are the glam o meter blogger. Hope you had a scary night. I waited all night for you to come knocking on my door in a creepy costume Jane! WOOOOOOOOOO! Sir Paul, you know how to PARTAY DOWN! Come on now, do a dance for us...come on! teehehee...HAVE FUN! Sir, might I humbly request of Thou to become my Personal Stylist for each glamourous day of the year, meaning 365 in toto, Gratitude and Awe would be guaranteed. Let's meet at the flight of stairs in my castle, and please bring with Thee the small item I lost at the last ball. Well lets see if the shoe fits Madame......hee hee! Paul, This was the glam highlight of Halloween! Dreaming about wearing one of those amazing pieces. I bet your parties are spectacular! Love to see pics. Hope you had a scary, but fun night! But HEY! We got to keep the Hershey Bars because no one came for them! before the pumpkins freeze. Happy Thanksgiving. I do believe that's showy!